It’s been about 9 weeks since I joined the Hyland’s Powered Team to train for the Boston Marathon and share my journey with you. I can’t believe we’re already 2 weeks away from the race!!?! That is both terrifying and exciting to me. 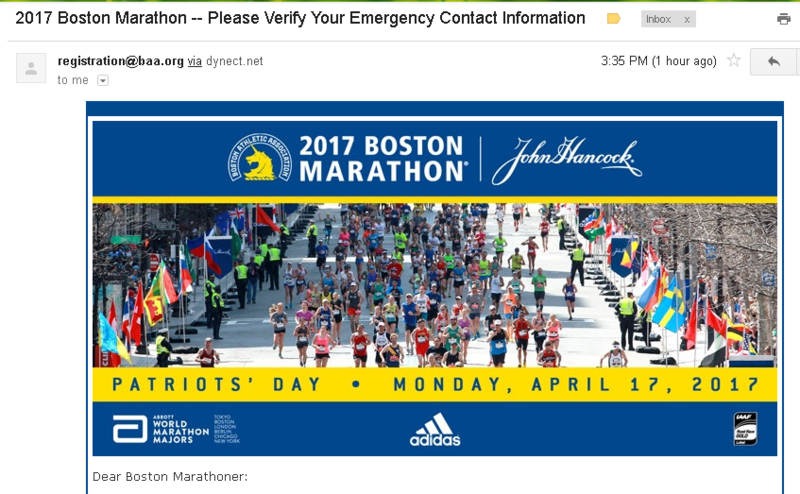 I just got this final confirmation email from the Boston Marathon and it just made it more real. It also made it kinda sad because my mom is my emergency contact person and I realized my usual partner in crime SkinnyRunner is not running the race this year! I feel like I know someone every year who runs the race and this is the first year there’s no one. The Hyland’s Team was put together for a few really good reasons. 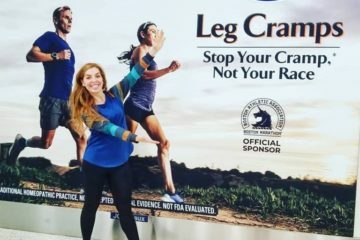 The company is a big sponsor of the race and wanted to highlight the 50th anniversary of the first woman to officially run the Boston Marathon. So they put together an all female team to share the journey of training to run 26.2 miles. B.) share our running, motivation, fears, struggles, blisters, excitement, triumphs, black toenails and more along the way to the race weekend. It was a process of learning about ourselves along the way to the finish line. I love that it’s been more than just about running because I know not all of my readers are also runners. And I’ve really enjoyed thinking about my fears and motivation and everything else along the way. This week we’re sharing a video of our thoughts 2 weeks out from the Boston Marathon. Check out the vlog below and let me know if you have any tips or advice for me if you’re familiar with the race! And send me your running / eating / random questions too. I love Q&A vlogs and podcasts so feel free to ask me about anything. Question: What is your FAVORITE part of a race? Oh my days I love the idea of an all female running squad! I’m running this year too for the first time. Super nervous and have ALL THE QUESTIONS too! I trust that they’ll get us to the start line with plenty of time, but I do question how to properly fuel for the race given that I’m in Wave 4 and likely won’t start until close to 11:30am (which is the latest I’ve ever started a full marathon, yikes!). Yes! That stresses me out. But I ran the NYC Marathon and it’s the same situation – I just took food with me. I live right outside Boston and will be spectating in my usual spot by Newton Town Hall. I’ll watch for you and cheer!! Tiffany!!! Yeah! I’m excited 🙂 See you there! 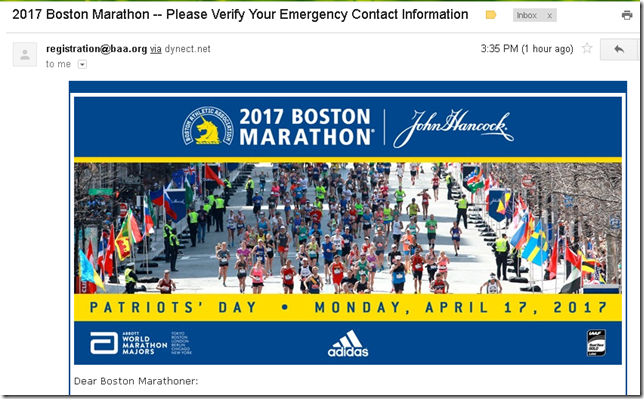 Boston is on my dream list for when I finally grow the balls to run a full marathon. That and NYC. 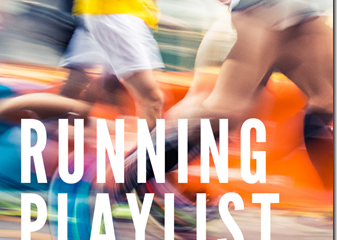 I’m thinking about starting to try for it next year, but I’m seriously terrified of the distance – I’ve ran 5 half marathons and those destroy me enough, I just can’t fathom running a full. My favorite part of a race is the beginning – I’m always just SO EXCITED! Good luck on your race, Monica! My favorite part of the race is certainly when I get to the finish line. I think nothing can be compared to that. This is SO cool. I am running my 6th half marathon this Sunday and I keep trying to get myself to commit to a full… but I’m scared, intimidated… help! I live in Boston and I’m so excited for you! I ran my first marathon last fall and BQd so I will be doing it in 2018. Can’t wait. Super awesome to rock that out on your first!! Congratulations!!! Are you finding training for the marathon is different than when you train for other ones? What have you had to shift your focus on to? I’m so excited to hear about this experience through you! A lot of people talk about the hills on the Boston Marathon course – but local runners I’ve talked to say it’s not that bad? I don’t know what to believe. My favourite part of the race is the finishing line and the boost you get when you’re close!